It’s not too late to make medicine this season. As long as you can still properly identify the plant you are harvesting you can still make root tinctures. 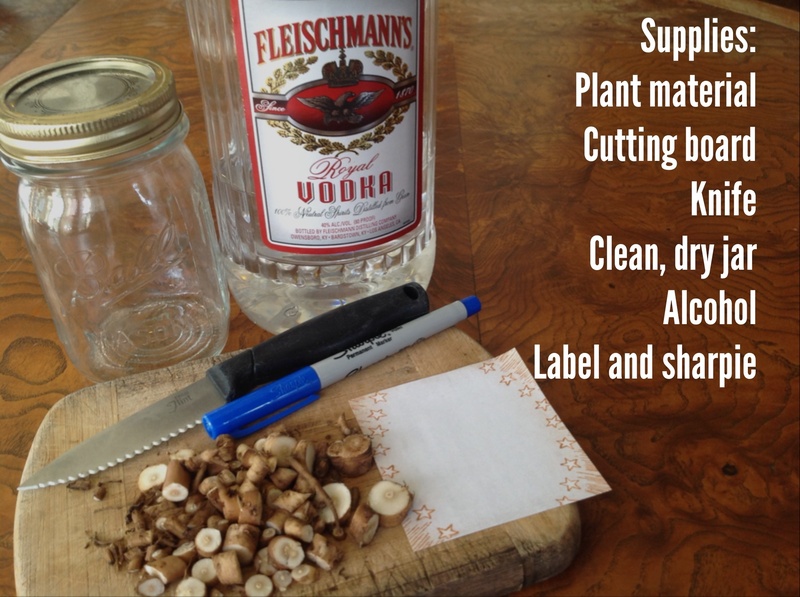 Root tinctures can be made until the ground is too frozen for your shovel. During autumn plants have flowered and gone to seed and green leaves and stems have dried and withered. If a plant is an annual then autumn marks the end of the lifecycle. If a plant is perennial, autumn marks the return of all of a plant’s life energy or metabolic energy into the roots or other underground parts to await the coming of the spring again. You can read more about the rhythm of medicine making through the calendar here. The underground parts of many plants are medicinal. Familiarize yourself with which plants have medicinal roots. Good choices for beginners are Dandelion, Yellow Dock and Burdock. The plant pictured in this tutorial is Dandelion. When you are ready to branch out a bit you can make root tinctures with local plants like Solomon’s Seal, False Solomon’s Seal, Wild Ginger, Wild Sarsaparilla, Trillium, Blue Cohosh, Black Cohosh, Bloodroot and others. It’s so easy! Let’s get started. All tinctures, including those made from roots involve two little bits of hands on work, separated by a several weeks. The following tutorial deals with the first part, the part I call infusing. The second parts is called decanting. How much? Roots are concentrated and less watery than soft berries and juicy leaves and stems. Most herbalists use considerably less than they use when make a flower, berry or leaf tincture. Herbal textbooks often suggest a ratio of one part plant material to five parts menstruum. (Menstruum is a fun, old fashioned word meaning the medium you use to extract plant chemicals or constituents). If you want to get really fancy about it, this ratio of 1:5 is by weight. However, I and many other traditional herbalists just eyeball it, essentially make a rough estimate based on volume. I also don’t worry too much about the 1:5 ratio and sometimes make my root tinctures with a 1:4 or even a 1:3 ratio. After all, I’m not going to discard a bit of extra wildcrafted root, just because I got a bit more than I needed. these are pretty self explanatory. Do choose a glass container to infuse your tincture. Plastic leaches chemicals. You can use any alcohol you want. I prefer 80 proof alcohol, which is 50% alcohol and 50% water. This will help to extract both water and alochol soluble plant constituents. Your friends, family members and clients will love the taste of handmade tinctures made with 80 proof alcohol. 195 proof grain alcohol tinctures that are available commercially really burn. I also like to use vodka because it lets the flavor of the herb shine through. I do a lot of teaching and I like being able to share these pure flavored tinctures with my students. Brandy, however, is another common choice. Brandy lends a bit of sweetness. The difference between most cheap and more expensive alcohols is simply a matter of taste and in the case of tinctures you don’t really need to get the more expensive brand. Gluten free alcohols are increasingly available for those who need or desire it. Expect to pay premium prices. Organic alcohols are available in some markets. I sell a lot of tincture. I like the feeling that my tinctures are affordable to lower income folks or young families so I focus on organically grown and ethically wildcrafted plants and use the cheaper alcohol, but you should choose whatever works for your budget and values. So let’s assume you have successfully and confidently identified your plant and have harvested it. You should wash the roots. Flowers and berries are often clean enough that you don’t have to do anything with them, just stuff them in the jar. Leaves often just require a quick dusting off, but roots are dirty. Scrub them under running water (without soap) to remove the dirt, but you don’t have to be really obsessive about it. Eventually, they are about as clean as they are going to get and a little dirty discoloration is pretty normal. Chop them up roughly, just enough to expose more plant material to the alcohol. Step Two: Add your alcohol. You can fill the jar all the way to the top. 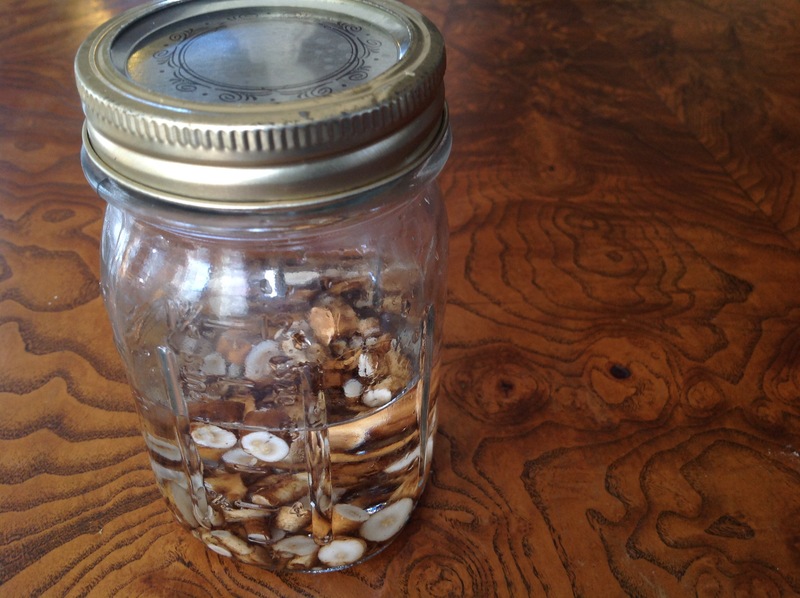 If your jar is a bit larger than you need, with root tinctures it is ok if you don’t fill it all the way to the top. 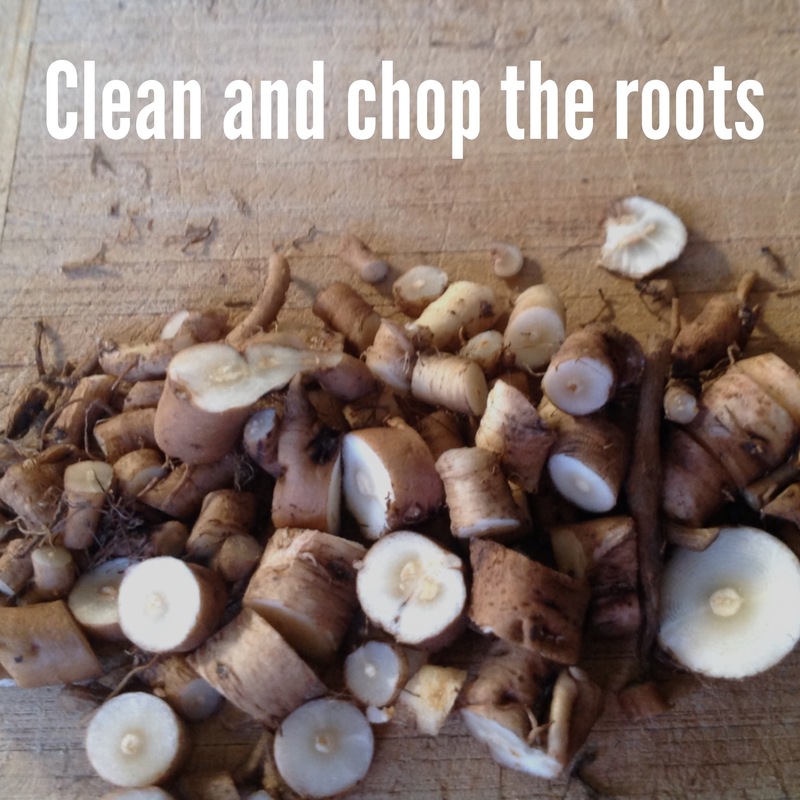 The roots will not spoil, go rancid, oxidize etc. The air at the top of a root tincture is of no concern. In my example, I didn’t have a perfectly sized jar so I filled it partially. Step Three: Label your tinctures with a permanent pen. Do not skip this step! Do not make the mistake of assuming that you will remember what is in the jar or you will be able to tell what is in the jar by looking at it or tasting it. 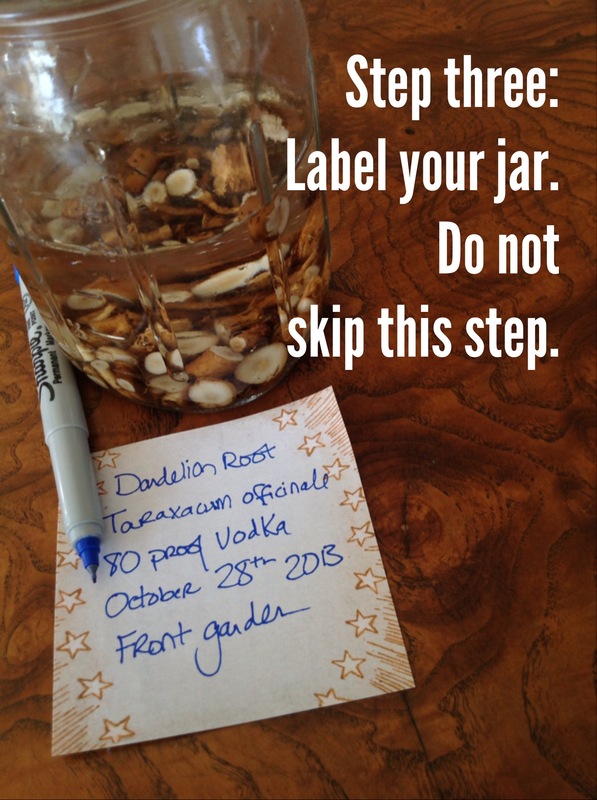 Learn from my mistakes and the mistakes of other herbalists and just label the jar! I like to label the jar with the common name of the plant, the type of alcohol used, the date tinctured and the location where I found or harvested the plant. If I am giving the whole jar to someone else I will often add the scientific name of the plant as well. Voila! You are pretty much done. Now you need to let your tincture stew or infuse. I just keep mine on a shelf or in a box on the floor by my herb cabinet. In both locations they recieve indirect sunlight, but are not sitting and stewing in the sun. Really, you can set them just about anywhere. I avoid putting them on top of the refrigerator or other places that are plugged in and may give off some type of electromagnetic energy. 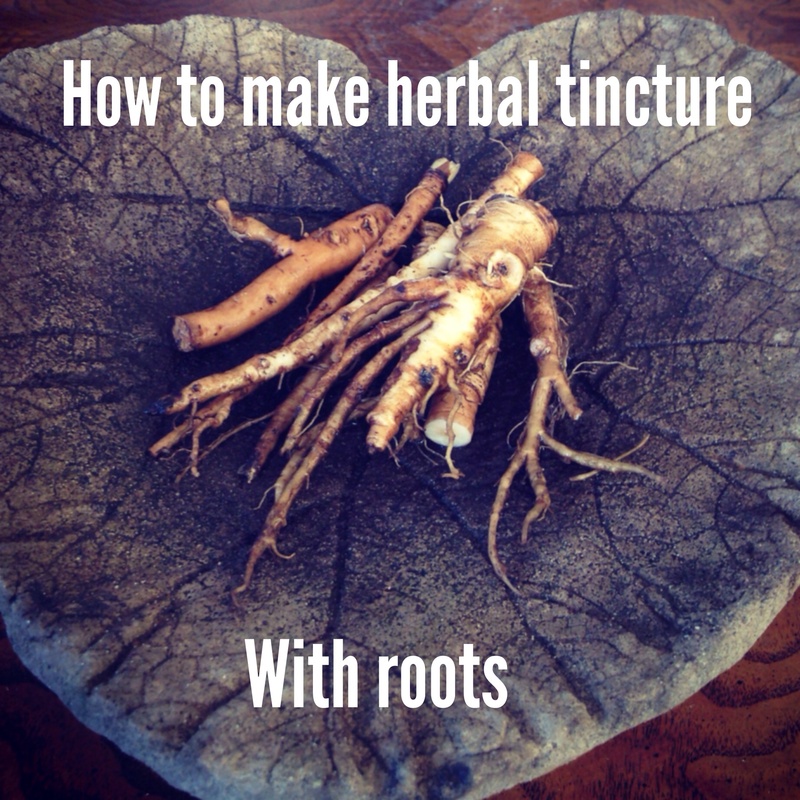 It is generally recommend that you let your traditional tincture infuse for 4-6 weeks. Four weeks will make a good, strong tincture. Many people like six weeks, which is a full lunar cycle. What if you don’t take it out of the jar for, hmmm, maybe four months, six months, even a year or two? Nothing. Don’t worry about it. Root tinctures should last pretty much forever. As I stated above, roots are not very watery. The alcohol in 80 proof liquors should effectively preserve your tincture indefinitely. Commence part two (decanting) at your leisure. You see, it’s so easy. The hardest part is the plant identification. This is exactly the type of tincture that I use in my clinical practice. These simple, low-tech tinctures are totally effective. Stay tuned for part two: decanting and storing. Luksusowa is a reasonably priced, widely available potato vodka that I like to use for tinctures. Another great article from Minnesota Herbalist! I just had to re-post! I’d like to know where Part 2 is: Decanting and Storing. Other option is making a syrup, which is water based and has a sweetener as a short-term preservative. Refrigerated, syrups can last for months. Thank you I do actually have some glycerin. It is good to know they are less potent. Another thing to remember is that it is important to get food grade glycerin. Some co-ops sell food grade glycerin. It is quite expensive. More affordable bulk glycerin is available online. Some glycerin is cosmetic grade and may be a by product of other industrial processes. Don’t hesitate to call the customer service number of online suppliers and find out if their glycerin is food grade. Some herbalists dry plant material and some do not. It’s a matter of personal preference. Most roots that I harvest are not particularly watery, so I have no worries about extra water spoiling or diluting the tincture. By using the roots fresh, I can skip a step. I also tend to believe that using fresh plant material means there is less opportunity for fragile plant chemicals to either degrade or evaporate. I think fresh plant tinctures are potent and energetically lively. If you do dry the roots first, you will still have a fine tincture that should work for most purposes.